Fall Flower Gala Arrangement in New Braunfels, TX - WEIDNERS FLOWERS INC.
Let the inspiring views and hues of autumn bring you warm feelings of friends, family and fall festivities. Send an awesome autumn arrangement to someone you know and love. 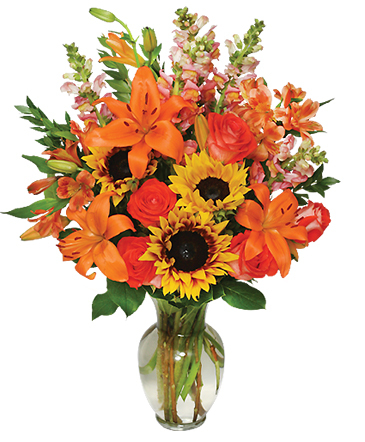 Call WEIDNERS FLOWERS INC. or order fall flowers online anytime! 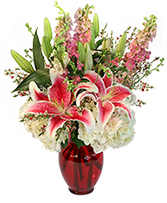 Red Ginger Vase, White Hydrangea, Pink Larkspur, Pink Stargazer Lilies, Pink Waxflower. Pops of pink mini carnations and white cushion poms stand out from green button poms in this cheerful arrangement. Show your appreciation with fresh flowers that are sure to make them smile! 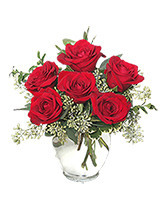 Call us at WEIDNERS FLOWERS INC. or order online flowers now.